It ‘makes sense’ that stimulating neurons in areas of the brain affected by Alzheimer’s would be of benefit, but as the researchers state, we won’t know for sure until the science is complete. In the meantime, if you know anyone in Montreal with Alzheimer’s issues, the study is recruiting. Insurers are starting to cover TMS for depression (after determining that SSRIs or other medications aren’t working for the patient). A full course, 24-36 treatments, of TMS can cost well over $10k. 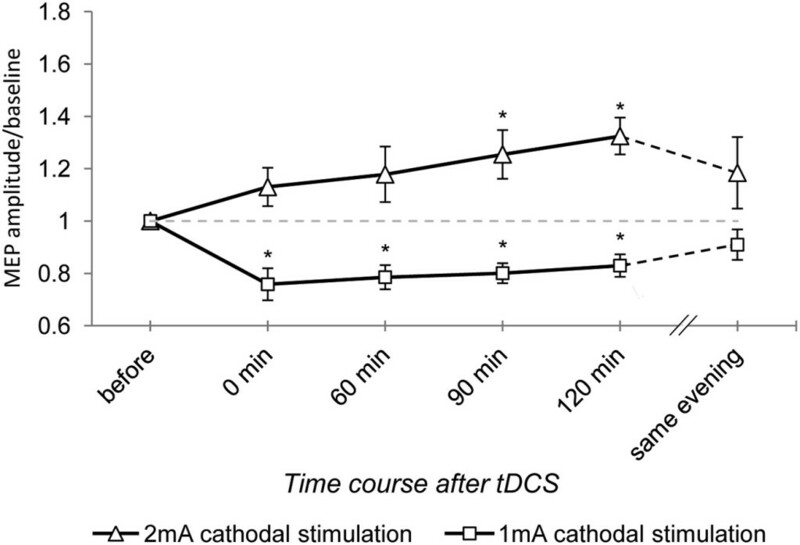 Though this is purely conjecture on my part, one way tDCS might make it into the mainstream is as a method to ‘top up’ post-TMS treatment as effects begin to fade. As the number of people suffering from depression rises, doctors are looking for new, more targeted ways to treat it. 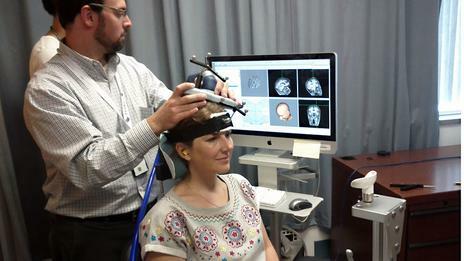 One approach used by doctors at UCLA and a handful of other centers nationwide is to beam magnetic pulses deep into patients’ brains, a therapy known as transcranial magnetic stimulation (TMS). The therapy is time-consuming, and only a few hospitals or clinics offer it, but its ability to work in a fundamentally different way from medications is also what makes it so promising for people not helped by drugs. Fascinating stories of people with Aspergers who discover feelings and empathy as participants in TMS (Transcranial Magnetic Stimulation) studies. Begs the question, what if, as the effects of TMS fade, tDCS could be used to ‘top up’ their emotional awareness? Frame of Reference From NPR’s amazing ‘Invisibilia’. Market forces, the for-profit bias that imbues every aspect of health care in America, skew R&D towards solutions and products that are highly profitable. That’s one of the reasons I was so curious about tDCS. You can do it at home. It doesn’t cost a fortune. My initial curiosity was inspired by research papers that seemed to indicate the potential for cognitive enhancement, primarily memory and learning. Many papers later, I’m not so sure, but where it comes to tDCS and depression I’m much more confident. There does seem to be an overwhelming amount of both research and anecdotal evidence to support the use of tDCS in depression. If that were better known, perhaps someone like the woman featured in this NBC news clip would have had somewhere to turn when she was denied coverage for continuing TMS treatment for depression. No mention of tDCS in his journey to find relief from severe depression, but some new to me and interesting information about treating his depression with Transcranial Magnetic Stimulation. Especially interesting is that a genome test recommended by his psychiatrist led to the awareness that many of the drugs typically used to treat depression would most likely be overwhelming to his system. Also that his insurer, Anthem Blue Cross (through the ACA, Obamacare) covered his TMS treatment. Links below to full article. 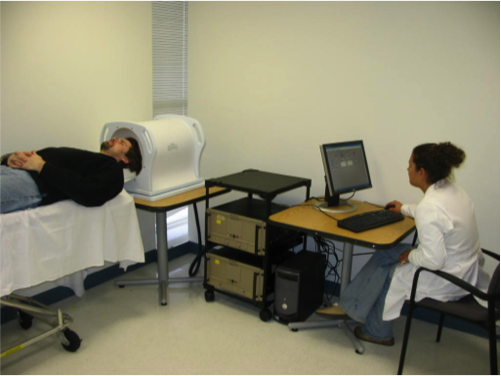 Transcranial Magnetic Stimulation, or TMS, is a depression treatment that was approved by the FDA in 2008. It involves placing a magnetic coil on the patient’s head, and stimulating neurons in a specific part of the brain known to be underactive in depression (the dorsolateral prefrontal cortex). Best of all, it has very few side effects: only some uncomfortable tapping on the head where treatment is applied. There are none of the standard side effects we’ve come to associate with medications. All roads LFMS lead to the Harvard Low Field Magnetic Stimulation Lab. But please follow along with what led me here in the story below. Dr. Shapiro’s company (he is the co-founder and non-executive director), Pure Tech Health created Tal Medical, to develop an LFMS treatment/device. In 2013, Tal received initial proof-of-concept data from a randomized, double-blind, sham-controlled trial in patients with major depressive and bipolar disorders conducted by McLean Hospital, a leading psychiatric research hospital affiliated with Harvard Medical School. In the study, a single 20-minute treatment demonstrated rapid onset of action, substantial effect size, and a strong safety profile. Given this unique, rapid effect of LFMS treatment, the National Institute of Mental Health has selected LFMS for a multi-site clinical trial. The trial is examining the efficacy and durability of the treatment over an extended period of time in patients with major depressive disorder. 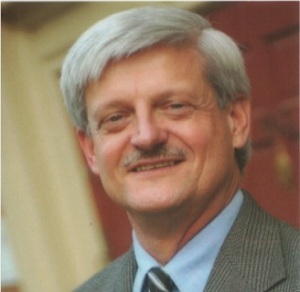 Researching possible patents led to Michael Rohan, Ph.D. and the Harvard Low Field Magnetic Stimulation Lab. I assume there is a partnership between the Harvard Lab, McLean Hospital and Tal Medical, though I could not find any formal announcement. Click through the lab link to do a deeper dive into ongoing research they are presently involved with, including clinical trials. Their training programme targets the brain’s ‘dorsal attention network’, which links regions of the prefrontal cortex – the bit of the brain above the eyes that helps us make decisions – and the parietal cortex, the ‘switchboard’ for our senses, which is above and slightly behind the ears. (Caroline Williams)The pulses were aimed at my left prefrontal lobe, to dampen the activity there (Caroline Williams)When I get to the stimulation the next day, it’s not as bad as I feared. At least not at first. For the first minute or so it feels a bit like popping candy is going off under my skull. Five minutes in, though, and it’s seriously annoying – like the worst school bully ever repeatedly flicking me on the head.In all, I have two eight-minute-long sessions of magnetic stimulation, each followed by a 12-minute-long session of computer-based training. I also do three 12-minute blocks of training twice a day, over the internet, wherever my laptop and I happen to be. TMS, not tDCS but fascinating that they’re having success treating PTSD and autism. Murphy says that after three to four months of magnetic therapy, his 10-year-old, who has Asperger’s syndrome, showed major improvement, to the point of no longer needing a constant one-on-one school aide, reading at a high school level and acing spelling tests when before he could barely write. via ‘Brain zapping’: Veterans say experimental PTSD treatment has changed their lives – The Washington Post. Though TMS not tDCS, it would be interesting to see the original paper (Targeted enhancement of cortical-hippocampal brain networks and associative memory – paywall). My understanding is that the hippocampus is a difficult target for tDCS. 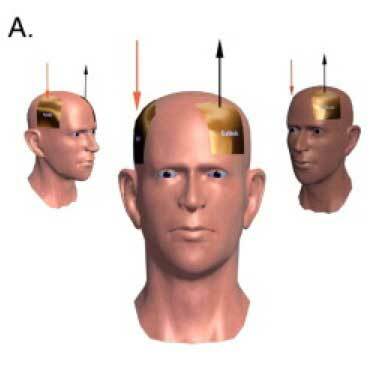 But perhaps insights from this study could lead to ideas for a ‘memory enhancing’ tDCS montage. To test this, Voss and his team of researchers had 16 healthy adults between the ages of 21 and 40 undergo MRIs so the researchers could learn the participants’ brain structures. Then, the participants took a memory test which consisted of random associations between words and images that they were asked to remember. Then, the participants underwent brain stimulation with TMS for 20 minutes a day for five days in a row. 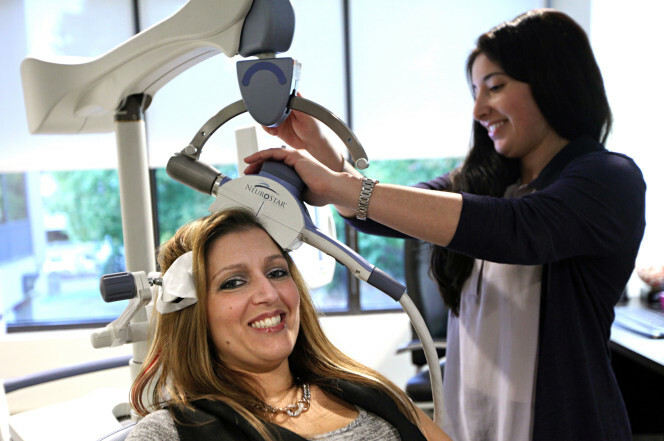 TMS uses magnetic pulses to stimulate areas of the brain. It doesn’t typically hurt, and has been described by some as a light knocking sensation. The researchers stimulated the regions of the brain involved in the memory network. Throughout the five days, the participants were tested on recall after the stimulation and underwent more MRIs. The participants also underwent a faked placebo procedure. The results showed that after about three days, the stimulation resulted in improved memory, and they got about 30% more associations right with stimulation than without. Not only that, but the MRIs showed that the brain regions became more synchronized by the TMS. via Magnets Can Improve Your Memory | TIME. 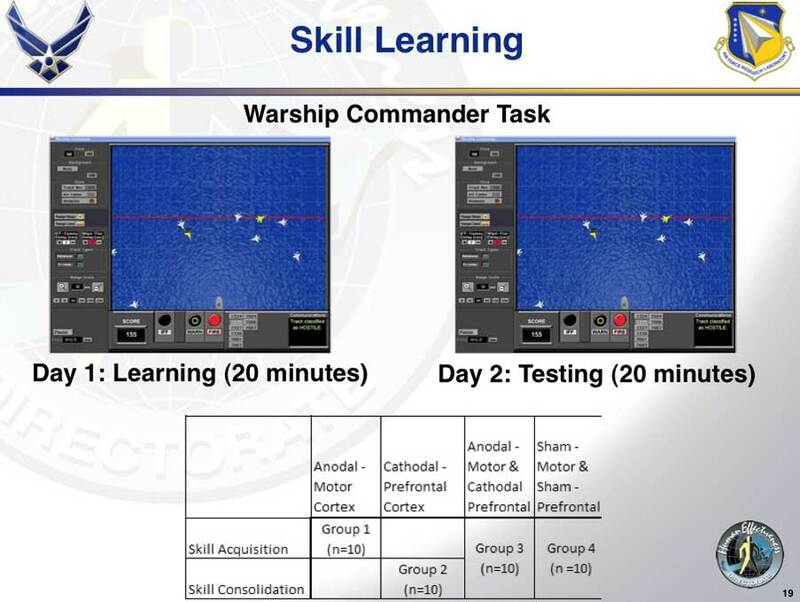 Every military application of tDCS I’ve seen so far specifically mentions drones and drone pilot training. This logo has a drone in it! For the record, I think the use of drones is illegal and immoral, and that the deaths of innocents is un-American and unacceptable. That said, the tDCS research coming out of this sector is fascinating and will no doubt have an impact beyond military training. [Update 7/30/14 I’ve replaced the old (broken) link with an active one that comes via Ryan (see comment below)] http://colonyofcommodus.files.wordpress.com/2013/02/2012-afosr-review-mckinley.pdf it was a public document. It appears to be a set of slides used in a presentation. 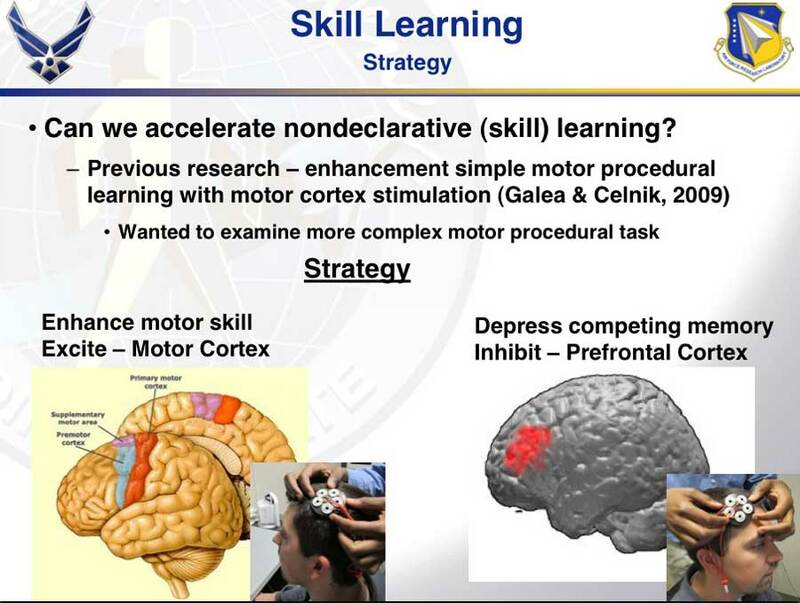 It documents the most aggressive use of tDCS for the purpose of learning and cognitive enhancement I’ve seen. You will conclude, after reading this, that the Air Force is not fooling around. Here is one of the more shocking aspects of the research: The notion that cathodal stimulation can have a positive effect by depressing ‘competing memory’. What? The plot thickens. There is weeks of research ahead for anyone diving deeply into this paper. A lot of new questions to answer.